Looking to take on investing for yourself? Here are some tips and tricks to keep in mind when venutring out on your own for the first time. You’ve got a great job. You’re making more money than you’re spending. Your loan balances are moving in the right direction for once and you’re starting to explore concepts like financial independence. You’re ready to start investing. You don’t want to fork over hefty fees to a financial advisor that might be a commissioned salesperson. But you know that sticking that extra monthly money into a cash savings account is probably not the best move. So you decide to become a do it yourself investor. After all, you made it through law school, so how hard can it be? When you get started you might have a four figure or low five figure portfolio. This is a great time to learn the ropes. Your financial life is pretty simple. Taxes are pretty simple. If you make a mistake, it’s not likely to hurt you that much because you don’t have that much money in the account anyway. If you’re not sure how you want to invest $10,000, it’s not going to get any easier when it becomes $50,000 and eventually $100,000. So you might as well dive in with what you have and see if you like managing your accounts. If you’re like most, you’ll find that it’s relatively easy and it’ll soon become part of your routine like everything else. Know that different people learn in different ways. Do you like reading books that you can pick up and put down over a month? If so, find some investment books written for a general audience and order the physical books. Sure, you have a Kindle and prefer it for reading on the beach, but these are books that you are going to want to pick up and read a chapter on some idle Saturday, so it’ll be nice to have a physical object around when you have some down time. The Simple Path to Wealth by JL Collins. Jim Collins has written a fun-to-read guide in simple and clear language with respect to building wealth. Great read for any investor. The White Coat Investor: A Doctor’s Guide to Personal Finance by James Dahle. Written by a practicing emergency room physician. While the book is geared toward medical students and physicians, many of the concepts are applicable to law students and lawyers. The Bogleheads’ Guide to Investing by Taylor Larimoe, Mel Lindauer and Michel LeBoeuf. Written by the Bogleheads themselves, with a forward from Jack Bogle, this guide to investing is a DIY handbook. Another solid option written for the general public. Others might prefer reading blogs and Internet forums. The Whitecoat Investor. With over 5 years of articles, there’s a ton of wealth and information here. Written by an emergency physician doctor in Utah but still applicable to many lawyers. The Finance Buff. The archive stretches back over 10 years, so you know there’s a high likelihood that Harry has written about a topic you’re interested in. The Oblivious Investor. Mike is another writer with years of experience. He has a particular knack for explaining complicated concepts in only a few short and clear sentences. The Bogleheads Forum. Sometimes called the friendliest place on the Internet, the pros show up at the Boglehead forums to talk about investing and personal finance. Searching through the forum you’ll find answers to commonly asked questions. If you have a particularly sticky tax situation, sometimes it feels like it’s the actual IRS that will respond with helpful guidance to your questions. Sometimes new investors can go one of two ways when getting started: swing for the fences or park it all in cash. Don’t swing for the fences. When you’re first getting started it’s about hitting singles and getting players on the bases. You absolutely don’t need a home run during your first at bat. Since many lawyers start investing in their 30s and with a small amount of money, there’s a combination of feelings that will lead to trying to get a 5x return. First, you think that it’s a small amount of money and so why not try to turn it into something “big”. And second, you recognize that you’re “behind” thanks to three years of law school and $200K in student loans, so you feel like you need to do particularly well today to “catch up”. Resist both impulses and focus on a slow but steady progress. Don’t park it in cash. The there side of the coin is a conservative investor that wants to put the money in 100% bonds, TIPS or some sort of stable value fund because they don’t want to “lose” money. After all, it’s been three years of law school, $200K of student loan debt, so the last thing you want to do is throw away this $10K that you managed to save up. But keeping it in cash is a sucker’s bet because you can’t see inflation slowly eating away your purchasing power. Like compound interest in reverse, by the time you realize your mistake you’ll have missed out on some prime years of time in the market. You’ve got to deploy the cash according to your investing plan and make the money work for you. You won’t see progress unless you track what you’re doing. That means you need to start making an assessment of where you stand each month. It doesn’t have to be fancy (in fact, the less complicated the more likely that you’ll stick with it). A simple excel spreadsheet with your assets and liabilities should do the trick. The importance of tracking your net worth and investments is that human beings are awful at predicting the future. We just weren’t built with the ability to project a vision of ourselves decades into the future. Survival of there here and now nature ranked much higher. This is why the power of compound interest escapes our understanding and why it doesn’t feel that great to be saving X dollars a month. I don’t even have to put in a number for “X” because I promise you that no matter what “X” is it will feel insignificant compared to the hundreds of thousands and even millions of dollars you will have saved up if you continue on a slow but steady course of saving. “X” just feels small today because it represents only a fraction of the eventual goal. However, that fraction does add up over time. And time is going to happen anyway, whether you like it or not, so you might as well get started investing and you definitely should keep track so you can recognize the progress that you’re making. Don’t leave it up to your brain to remember how you you’re doing each year. Create a spreadsheet, track it and when you update your net worth each month, take a few minutes to look over your history and see were 3 months or 1 year ago. If you get into the practice of doing this regularly, you’ll remember what you were thinking and how you felt when you created those former entries. I can think of no more powerful way to remind yourself that each month of effort counts other than tracking your net worth. You might read this and think, “Yeah, sure” and then go back to whatever else you were working on. Writing an Investment Policy Statement sounds hard. It shouldn’t scare you off. I’ve written about my IPS before and provide you with Investment Policy Statement templates that you can use to draft your own. 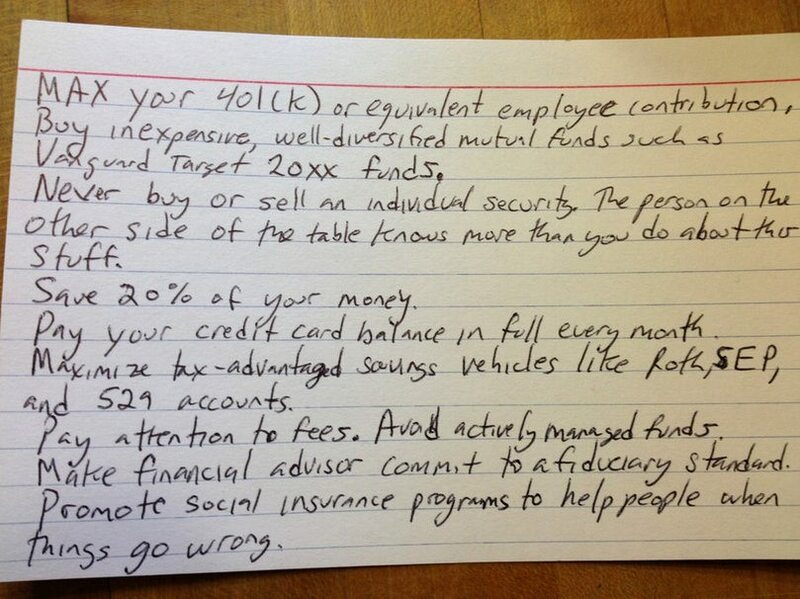 University of Chicago Professor Harold Pollack managed to fit his IPS on an index card and it went viral. The point is that it doesn’t need to be complicated, but you absolutely need something to refer to as you go through the years. The point of reading this site isn’t to obsess about money and spreadsheets. I like this stuff and write about it, but you don’t have to be in the weeds. You can keep it simple and get on with the rest of your life. An IPS is a perfect document that keeps track of what you hope to accomplish and how you will do it so that you can get back to living life and all the other non-money aspects of being a lawyer. Let’s talk about it. Join us over at Lawyer Slack to talk about the article or leave your comment below. Are you a DIY investor? I’ve had a lot of reminders lately about creating an Investment Policy Statement. I need to get this done. I love the templates-thank you so much for making it easy! It’s the lawyer in me. Everything is easier with a template. I’m a DIY investor for now. I’m trying to build up additional income streams in 2017: I already have a day job and some rental income, now I’m looking to get into some consulting, possibly start an online business, and write a book. There’s so many options, it’s tough to pick! Thanks for sharing BLI – have a good one! I’m a DIY investor and proud of it. 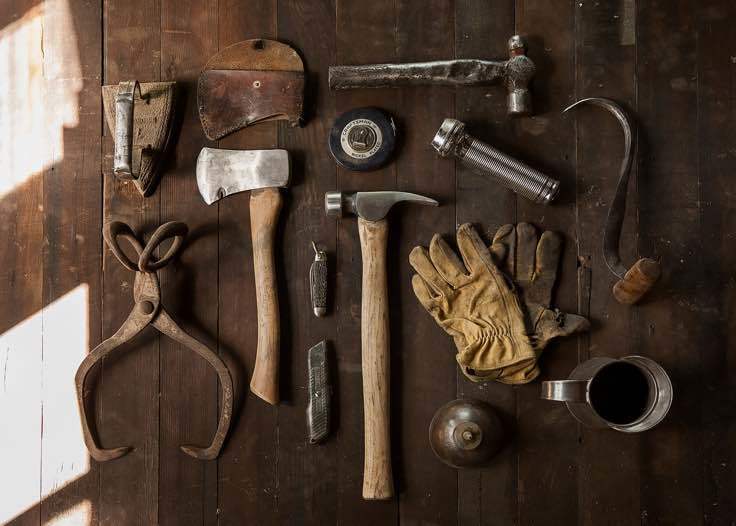 I can’t DIY anything else really – I have twenty seven thumbs that result in me being worse than useless in most DIY situations, but DIY investing I can handle. Praise be. bNice checklist biglaw. Very sensible advice.